The Weber State University Wildcat Club announced Monday that they have selected four former student-athletes and one former coach to be inducted into the WSU Athletics Hall of Fame. This year’s Hall of Fame inductees are Dave Arslanian (football coach), Jermaine Boyette (men’s basketball), Jeff Carlson (football), Tenille Howe Slack (women’s golf) and Stephanie Stanger Hale (women’s basketball). The five inductees will be honored at the Wildcat Club Hall of Fame Banquet on Feb. 27 and will also be honored at the WSU men’s basketball game on Feb. 28. Arslanian started his career at Weber State as a player in 1969. As a player, he played for his father, Sark Arslanian, who is considered one of the more prolific head coaches in school history. After getting his start at Snow College as a head coach, he moved up to Weber State where for seven years, he assisted head coach Mike Price from 1981-1988. During his tenure as an assistant, he helped the team succeed in many ways, including the Big Sky Championship title in 1987 and a trip to the Division I-AA playoffs. In 1989, he was selected to replace Price as head coach and remained in that position for nine years. During his tenure as head coach, he helped lead the team to another Division I-AA playoff in 1991 and led the school to a top three finish in the Big Sky Conference four times. Arslanian had a 53-47 record while at Weber State—the most wins by a WSU coach in team history. Boyette played for the Wildcats for three years from 2000-2003 and still remains one of the greatest players in school history. Boyette was a transfer from Salt Lake Community College that sat out his first official year from 1999-2000, due to league red shirt regulations. The following year during his second career start, he recorded 27 points for the team as they went on to upset then ranked University of Utah at the Utes’ home court. He was an All-Conference honors recipient all three years of play and during his senior year helped lead the team to victory with a 20.5 point per game average. In non-conference play, they were able to cap off the 2003 season with a victory over BYU in which Boyette scored 37 points. The team was able to advance to the NCAA Tournament where they lost to Wisconsin in the first round. Jeff Carlson was a four-year starter for the football team from 1984-1988 and helped lead the Wildcats to one of their best seasons in team history. 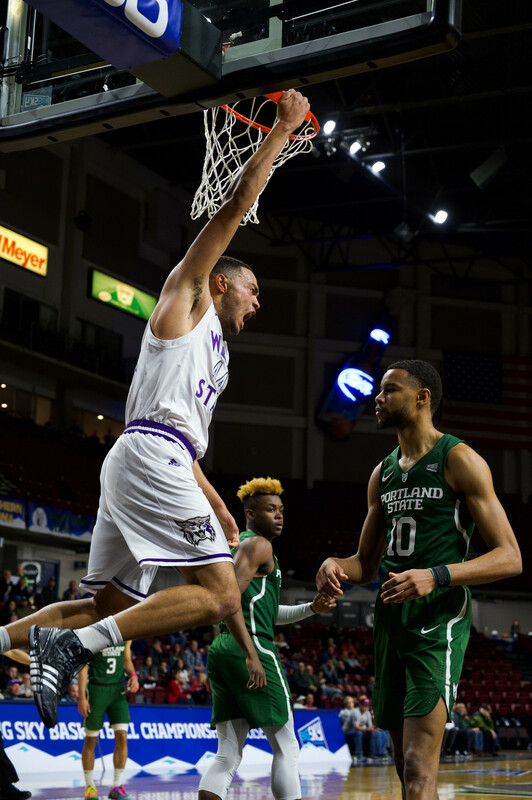 After only playing four varsity games during his first two years at Weber State, he became a star player for the Wildcats during his final two years. In his career at Weber State, he threw for 6,147 yards (third in school history) and 47 touchdown passes (third in school history). During his junior season, he helped lead the team to a 10-3 record, which still stands as the best winning percentage in school history. They posted a 7-1 Big Sky Conference record and went on to play in the Division I-AA playoffs where after defeating Idaho 59-30, they fell to Marshall 51-23. He threw for 3,044 yards that year and finished the season seventh in the nation in overall offense. Tenille Howe Slack was a four-year member of the Weber State women’s golf team and made history by becoming the first Wildcat to win a Big Sky title, as well as leading the Wildcats to their first ever conference championship. Slack was a graduate of local Fremont High school and had only played golf for one year before coming to WSU to play from 1997-2000. During her time, however, she racked up four Big Sky Academic All-Conference honors and was the Big Sky female scholar athlete in 2001. As a junior, she won individual honors in the championship and still stands as the only athlete to win both the Big Sky title and Big Sky Player of the Year awards. During her senior season, she helped lead the team to the Big Sky Championship and the NCAA West Championship where she was the second place finisher. Stephanie Stanger Hale played for four years on the women’s basketball team under head coach Carla Taylor from 1998-2002. During her tenure, she helped set records and helped lead the team to their first ever NCAA Tournament appearance. During her senior year, she helped lead the Wildcats to a 21-9 record and a 11-3 Big Sky record, both of which rank among the program’s best finishes ever. She averaged 15 points and 4.2 assists per game and netted 71 three-point shots, which was the record for both Weber State and the Big Sky Conference at the time. For her performance, she was named the Big Sky Conference MVP, the first WSU women’s basketball player to ever do so.